More Skip here for a listing of other depictions of Electric Chords (cartoon, prototypes, catalogues, etc). 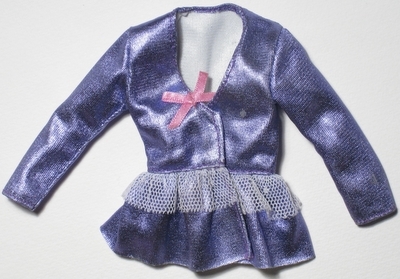 Jacket: Purple lamé with pink ribbon accent, off-white lace trim, velcro closure. Stirrup pants: Pink with black stripes spandex, elasticized waist and velcro closure. 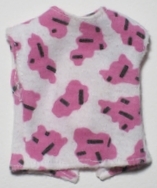 This pattern was going to be reused for other clothing pieces in 1988, according to the photos in the Hasbro Pre-Toy Fair Catalogue Matching Medley Fashions. Hair bow: Purple lamé with pink ribbon accent, off-white lace under layer. 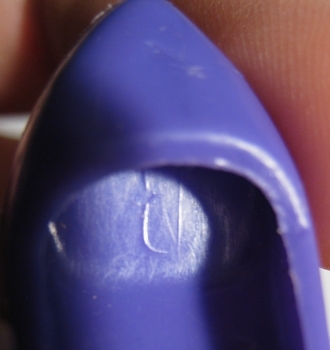 The two Music is Magic outfits with pumps came with distinct shoe molds that have a very large letter (backwards, A thru D found so far) printed inside the sole. This seems to be the easiest way to tell this shoe apart from other purple straight edged shoes. 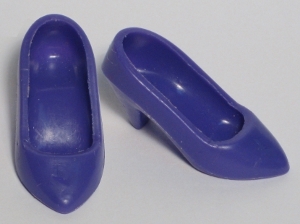 However, it is also possible that some Electric Chords fashions came with thin edged dark purple shoes. Go to the shoe guide to read more about the differences. keyboard with strap: Pink plastic with painted keys, thick white ribbon strap. *I don't own this fashion NRFB so I can't say which, if any posters and inserts originally came with it. Have included poster and MTV offer in Italics - it seems reasonable to assume these items would also come with Rock 'n Roses as they came with all other Music is Magic fashions that I have opened. the pink ribbons may be missing. blouse design may be paler pink. 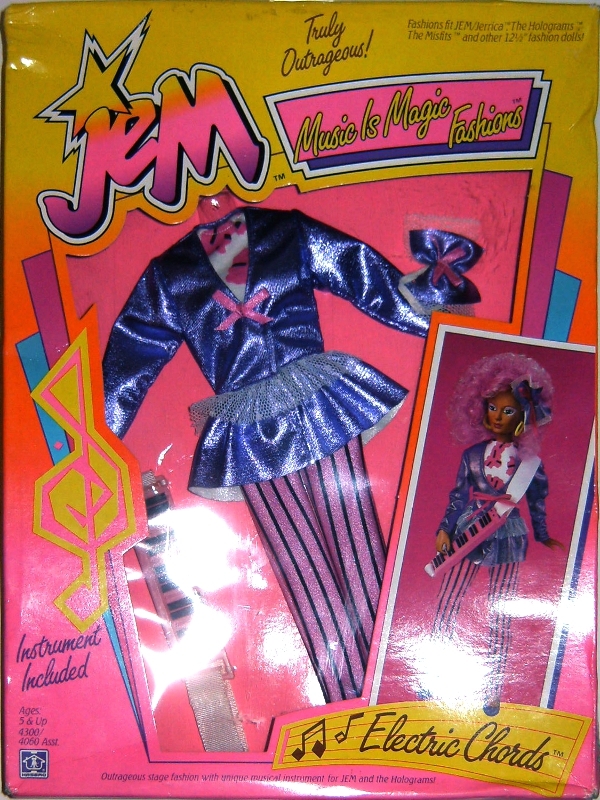 Music is Magic fashion boxes. Same photo appears on the 2nd year catalogue poster. the keyboard still looks darker pink than the one produced. Earrings are shown -they are not included. Illustrations: Cartoon It did not appear on the cartoon. Credits: Thanks to Glamour to Divaz for the hairpiece photo. Thanks to missbean for the photo of the NRFB fashion & contents listing. Thanks to Matt for the Electric Chords box information.